The first historic Danish King Gorm the Old ascended the throne around 940. Legendary Kings go back till the 8th century. Gorms descendants died out in the male line with Harthacnut King of Denmark (ca. 1020-1042), after which the descendants of his sister Estrid ruled till 1412. Last representative was Margrethe I Queen of Denmark (1353-1412), who became Queen of Sweden in 1389 and was married to the King of Norway, thus uniting the three countries. Dying childless, she was succeeded in these countries by her grandnephew Eric of Pomerania (1381/82-1459). He was deposed in Denmark and Sweden in 1439 and in Norway in 1442. After a brief interlude by Christopher of Bavaria, Christian I Count of Oldenburg and Delmenhorst (1426-1481) succeeded in the Kalmar Union of the three Scandinavian Kingdoms. Sweden left the union in 1523 and elected Gustav Vasa as King. Denmark and Norway were ruled by the same Kings until 1814, when Norway joined Sweden, as Denmark had supported Napoleon. The descendants of Christian I died out in the male line with Frederik VII King of Denmark (1808-1863). His sister Charlotte Princess of Denmark, her son Friedrich Prince of Hessen-Kassel and her daughter Louise Princess of Hessen-Kassel relinquished their rights in favour of Louise´s husband Christian Duke of Schleswig-Holstein-Sonderburg-Glücksburg (1818-1906), who acceded the Danish throne as Christian IX. 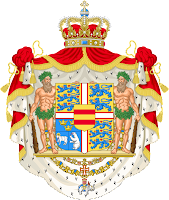 The Danish Royal Family descends through the Dukes of Schleswig-Holstein, with as ancestor Johann Duke of Schleswig-Holstein-Plön a son of Christian III King of Denmark, Norway and Sweden, of the Counts of Oldenburg. Eldest ancestor is Egilmar Count of Oldenburg, mentioned in 1088. 92. Albert Franz August Carl Emanuel Prins van Saksen-Coburg en Gotha * Rosenau bij Coburg 26-8-1819 † Windsor 14-12-1861; Prince Consort sed. 25-6-1857; Zn van Ernst I Hertog van S.-C. en G. en Luise Prinses van Saksen-Gotha-Altenburg = 38. 93. Alexandrine Victoria Koningin van Groot Brittannië en Ierland, sed. 1877 Keizerin van India * Londen 24-5-1819 † Osborne 22-1-1901; Dr van Edward Prins van G. B., I. en Hannover, Duke of Kent and Strathearn, en Viktoria Prinses van Saksen-Saalfeld-Coburg = 39.